Last school year I sharpened new pencils with a resolved calm on the outside but my insides were churning like the pencil sharpener. I had it easy for a while with a Baby or Toddler almost always hanging out while I taught, but my school age kids were so little it hardly mattered. The one on one attention I was giving them at their young ages was more than adequate. My littles were starting to get older and just as the inches piled their growing heights on so did their quest for knowledge. Beginning our homeschool year with 3 kids to teach and Little Brave at just 1 prepared to wreak adorable, toddler havoc all over my school plans and I knew it. The toddler in him and the curiosity in my kids had me stretched far too thin. Could I really give my kids the education they needed as well as meet the needs of my little one? Something had to change, I couldn’t keep teaching my kids every subject separately at the rate I was going. Last Summer I thought I had discovered this new concept of morning time until I remembered that was something my Mom had done so obviously when I was young. Us young Homeschool Moms sometimes forget that our new, hip educational ideas are often old and obvious to our Homeschool Mom predecessors. I had temporarily forgotten about those days of sitting down discussing the weather, reciting the Pledge of Allegiance, learning bible verses and singing songs together. My Mom did Morning Time before it was cool. Only she never called it “Morning time”, it was just school. She would bust out the classic Learning At Home by Ann Ward and we would enjoy learning together. When it came to me implementing morning time with my own kids at first it just seemed like a waste of time. I loved the idea but didn’t know if it really made sense to take so much time out of our morning and not have the bulk of our most important subjects done like math & reading. I reluctantly started our new school year with morning time, but only with my two middle children and what I found was that everyone wanted in! Not only that but everyone was learning. It probably felt like an accident to my kids, fun along with learning? Mom couldn’t have planned that on purpose. Of course my 8 year old wanted to be a part of Morning Time and my toddler would play, usually pretty disruptively, but it still worked! 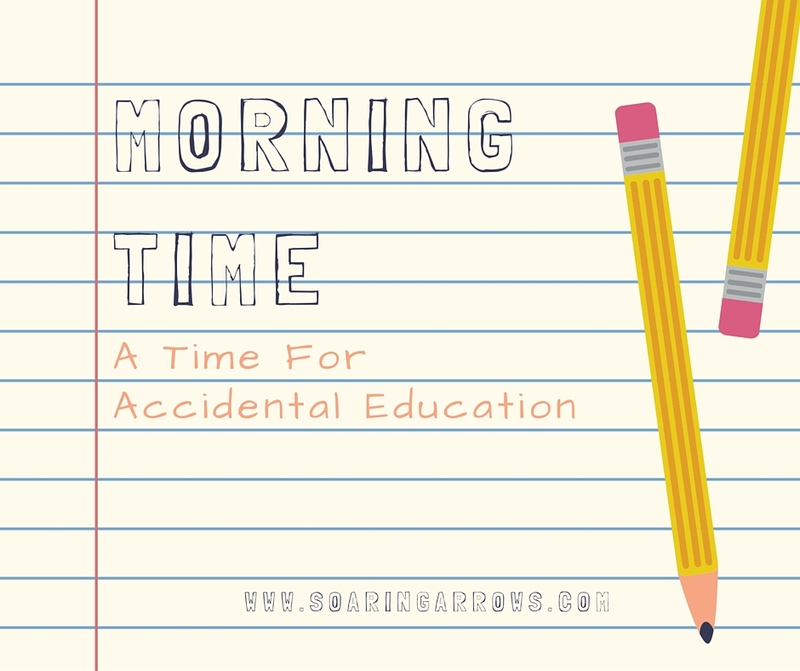 This year I have created a morning time that will connect all of my kids from toddler to 3rd grade. Morning time is all about getting our school day off to a good start. We spend time with God, learn bible verses, get acquainted with character qualities, sing songs and make sure everyone leaves with a smile! It is nearly impossible for kids to learn at home if the atmosphere of the home isn’t warm and inviting. That is my goal as I plan our morning time for this upcoming school year. I also added any subjects we will be studying together, like science! We will be using Who Is God? for our Bible curriculum this year. An in-depth look into who God is and what that means to us as Christians. This is written perfectly to be used for multiple students. The lessons are so rich that Mom is going to be learning as well! It includes two levels of notebooking journals to be used for elementary age kids as well as a coloring book for young children who are following along! In addition to studying the Bible we love reading missionary stories. They show us people who lived with true character and dedication to God! An excellent way to learn Geography as well, getting the kids to make connections with the countries we are learning about and understanding the heart God has for the world beyond our backyard. We started using these cards from We Choose Virtues last year and are absolutely fantastic for teaching kids what the virtues mean! They learn the meaning of the word as well as what the virtue does not mean. So for Obedience they learn that it means you are not argumentative, unwilling or slow and won’t refuse to do what you’re told. There is a bible verse at the bottom of each card to reinforce the biblical foundation for each character quality. Each card is brightly colored and my kids love looking at them and learn what each card means! It even helps me to memorize the definition so that when they aren’t following what I need them to do, I can remember to say what I am expecting word for word. I wanted to add something this year that would be interesting to my toddler as well as my three older kids! I choose The Complete Book of Rhymes, Songs, Poems, Fingerplays & Chants. This is a huge book filled with just about every song, fingerplay or rhyme you could remember from childhood! There are over 700 in this book which is organized alphabetically and there is a CD you can get to go alongside it. My older kids may be a bit too old but I know they will have fun teaching these to my younger kids which is also a great learning opportunity for them. Just a few minutes of reading this Encyclopedia each day will give my kids some fun facts about science as well as history. They love this book anyway so I know they will be thrilled for me to read a bit each morning. There are links on nearly every topic that give you more information online like videos to watch, pictures to look at more just more information if they are interested! A whole collection of stories about animals! These stories are perfect for getting kids to make connections with nature through a living book. The illustrations are absolutely gorgeous and I am always amazed how well my littles learn through stories about animals & nature. We will probably go through this one in about a month and then I will have to find another living book to add to our morning time routine! Just for fun. I love the way the art brings these classic stories to life in a completely unique way. I try to hide school books from my kids to make them more excited but my kids already cannot keep their hands off of them! I decided to add our science curriculum to our morning time simply because all of my kids will be using it together! Because my Kindergartener will be joining us we will be taking this curriculum slow this year. The days we have an experiment we will just do it in the afternoon! I should mention that many of the books that are part of Morning time are also a part of our Sonlight curriculum, where we find our best book recommendations! Morning time is all about being relaxed and just enjoying learning together. Keep it simple and don’t put any unnecessary pressure on yourself. Create a plan that works for you and choose books that will engage your kids with curiosity. It adds a Fun Mom factor to homeschooling. You and your kids are likely to learn accident or not! Great list of resources, Mama! Thanks for sharing!